In the previous post I outlined how to query the XTide software with R and parse the results into a handy-dandy data frame. The biggest hurdle with that method is getting XTide up and running on your computer. The code outlined here works entirely within R, so you don’t need XTide installed on your computer. The trade-off is that it provides substantially less information. This script only produces tide height predictions at a user-specified interval (1 to 60 minutes), and doesn’t pick out high tide, low tide, sunrise, sunset, or any of the other fun stuff that XTide can produce. Additionally, this version only works for a subset of 637 of the NOAA tide stations rather than the 1000s of stations that XTide can output. The available stations are found on this page listed with the type ‘Ref’, rather than the ones labeled ‘Sub’. If all you want is a series of continuous tide height predictions for a NOAA reference tide station, this script and the associated Rdata file will do it for you. Fair warning: the actual prediction routine is not vectorized, so if you ask for many weeks of high-frequency data, the script will take a few minutes to run. An illustration of tide height predictions from the script. 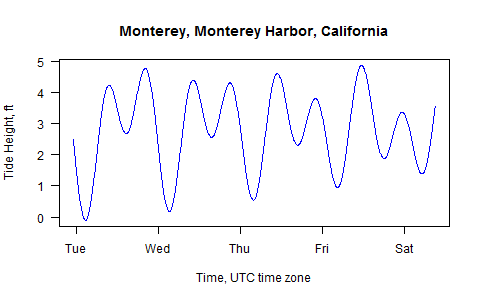 The script tide_prediction.R and the harmonics file Harmonics-20120302.Rdata can be found in my GitHub repository. The tide_prediction.R script is shown below. # NOT FOR NAVIGATIONAL USE. DON'T WRECK YOUR BOAT BASED ON MY BAD CODING. # like sea level have a tendency to change over time. # The output is stored in a data frame called 'results'. # Only the stations labeled 'Ref' will work with this script. # the harmonics Rdata file. # correct equilibrium and nodefactors for each year. # which isn't necessarily the time zone of your tide station. In addition to these tide prediction routines, I have also previously provided R scripts to query the NOAA servers to retrieve measured, verified historical tide height data. That process is shown in this older post.